encore Deals! | Online presales have ended! Tickets will be available at the door while they last. Online presales have ended! Tickets will be available at the door while they last. Discounted Presale Ends at Noon Saturday! Live Music! Food Samples from Nominees! Raffles and Prizes! Party with the Best of the Best! NOTE: This event sold out quickly last year. If you are a nominee and plan on attending, please purchase tickets early. Celebrate with the best of the best! 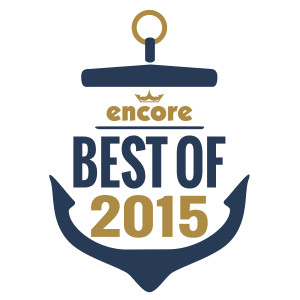 encore magazine and DREAMS of Wilmington are pleased to announce encore’s Best of 2015 80s Dance Party and Awards Banquet! Join us as we honor the nominees and announce the winners of our annual Best of Wilmington readers poll! Proceeds from ticket sales benefit DREAMS, a nationally award-winning nonprofit dedicated to building creative, committed citizens, one child at a time, through providing youth in need with high-quality, free-of-charge programming in the literary, visual, multimedia and performing arts. Live music in our annual Best Of Battle of the Bands! Attendees will help choose the winner from the three nominees for Best Band! And of course, winner announcements throughout the night! Raffles will continue to help raise funds for DREAMS. Dozens of the newly nominated business have donated gift certificates, merchandise, free food, service vouchers and more!